Being an elite athlete in any sport is hard on the body and mind. In essence, your job is to be (and stay) better at something than 99.99% of other people. That’s not for the faint of heart. For NBA players, staying in shape for basketball is even more of a challenge because the sport demands that big guys stay both strong and fast, and better than their competition. From a biomechanical standpoint, that’s the very definition of a tough call right there. Muscles give. Tendons stretch. And the bigger you are, the harder it gets to bounce back from that kind of pummeling. Sure, you can take a bunch of precautions to stay fleet of foot in the off season. Health supplements will keep the body well replenished. A good sports physician and physical therapist will work wonders for treating injuries. But training factors into this too. A sedentary life in the off season is simply not an option for an NBA player. 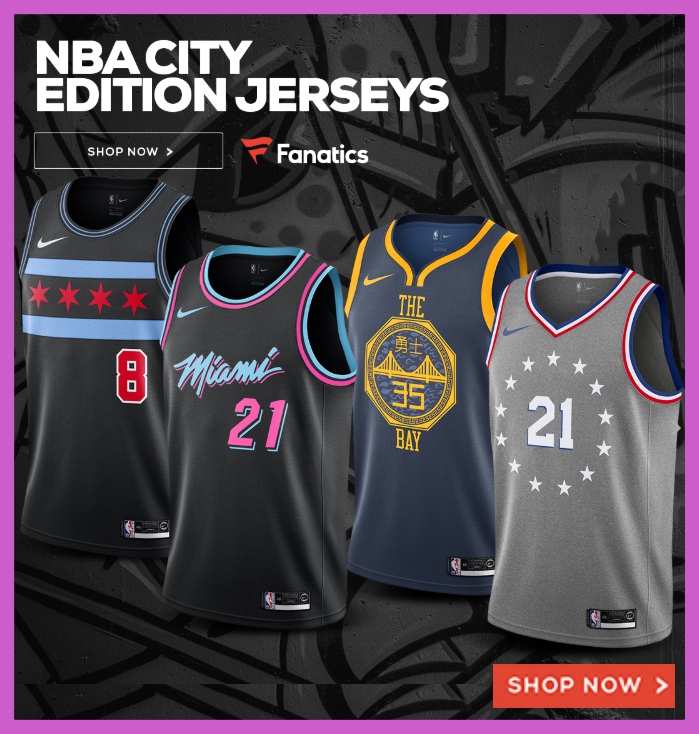 So, what works and how do NBA players train during the off season given the huge physical demands place on them when their livelihoods depend on being at their peak when the next season begins? In no order, here’s five ways NBA players stay in shape during the summer months. A lot of people are a bit surprised by just how many elite NBA athletes build yoga into their off season (and on season for that matter) training. 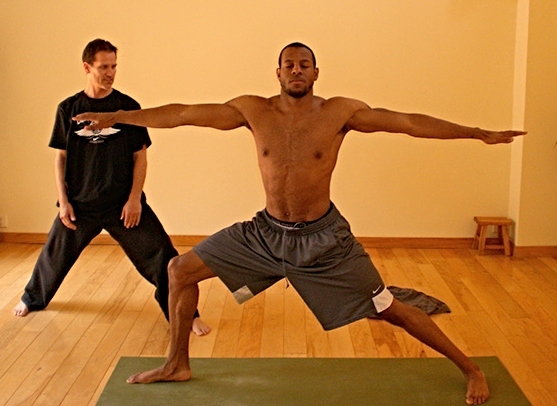 The list of players that use Yoga to maintain their body is long, but some of the more well-known players include Andre Iguodala, Myles Turner, Dirk Nowitzki, Kevin Love, and legendary coach Phil Jackson swore by it. Why is something so zen, gentle and non-competitive, so enthusiastically adopted by people paid to be aggressive and relentlessly competitive on the court? The evidence about yoga is pretty much undeniable. Done right and done often, yoga actively prevents the body from muscle, ligament and tendon injury. It’s especially ideal for basketball off-season training because it supports total body toning and general resilience when the body is placed in odd or off-balance positions. Basketball is a sport of immediate, explosive agility. It challenges the body to twist, adapt and withstand a myriad of unexpected forces in strange positions. Yoga is a slow-motion way to prepare for just those demands. There’s another benefit of yoga too. Pretty much every yoga move in the book promotes core strength — and we’re not just talking about a relatively simple abdominal contraction. Yoga promotes a more all-encompassing general resilience across the whole midriff and back. This is exercise nirvana for unusually tall people, as back and abdominal muscles are typically more vulnerable to injury among tall folks. This is kind of a no brainer. Of course NBA players are going to be hitting the weights all year round. Even though the game is primarily about speed and agility, it’s a misnomer that those attributes don’t rely on strength. Your average NBA player is going to weigh a tad north of 200 pounds. That’s a lot of mass to move if you’re aiming for speed, and that won’t happen without inordinate explosive strength. 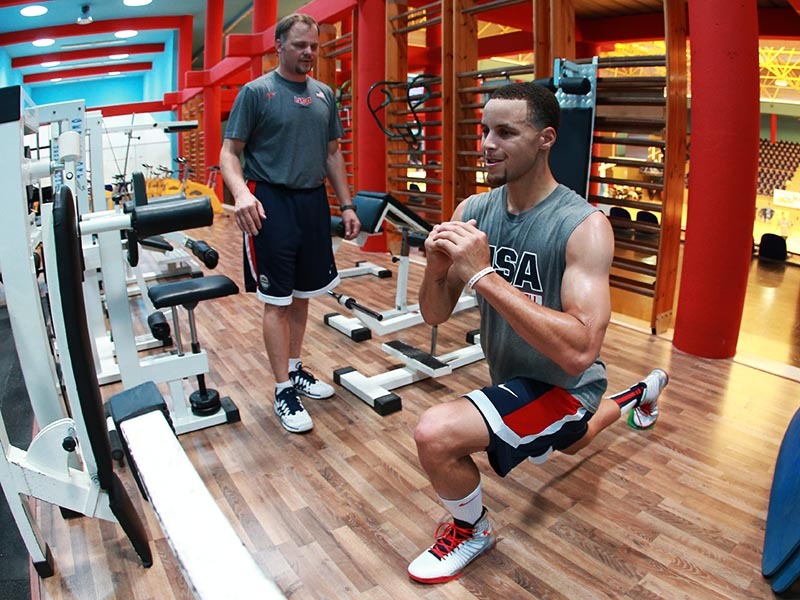 A typical NBA weight training routine is going to involve plenty of weight moves incorporating lunges and squats. Maintaining explosive jumping strength is going to place an elite basketball player in a good position to hit the ground running when the season starts off. An important consideration for weight training though is injury management. It’s common for an elite basketball athlete to be dealing with one or more injuries come the off season. A good weight training program is going to carefully manage those injuries, avoiding undue strain on muscles which need rest and recuperation. A good sports physical therapist is often heavily involved in building a successful routine for strength building and injury management. Getting more specific, guards are likely to train to build lean muscle mass because too much bulk isn’t doing a guard any favors. For centers and power forwards, muscle bulk is more of an asset, so you’ll see heavier weights put into play and a lot more focus on upper body. Plyometrics is kind of old school, but it features prominently in off season training for many NBA athletes, simply because it blends agility and body weight training into strength building. Again, plyometric routines are likely to be approached with caution and carefully managed to avoid placing too much strain on the muscles that are recovering from injury. Body weight training like plyometrics will promote agility and general body awareness, but it’s also harder to control and regulate. As a relatively high impact form of exercise, it can exacerbate joint injuries if not managed conservatively. Nevertheless, the great advantage of plyometrics is that many of the moves emulate the agility drills which form the backbone of training in pre-season and during the sports season. Plyometrics is valuable because it keeps the body prepped and the muscle memory primed for the training onslaught that awaits. The noble art and science of sparring is another common mainstay for NBA players in the off season. 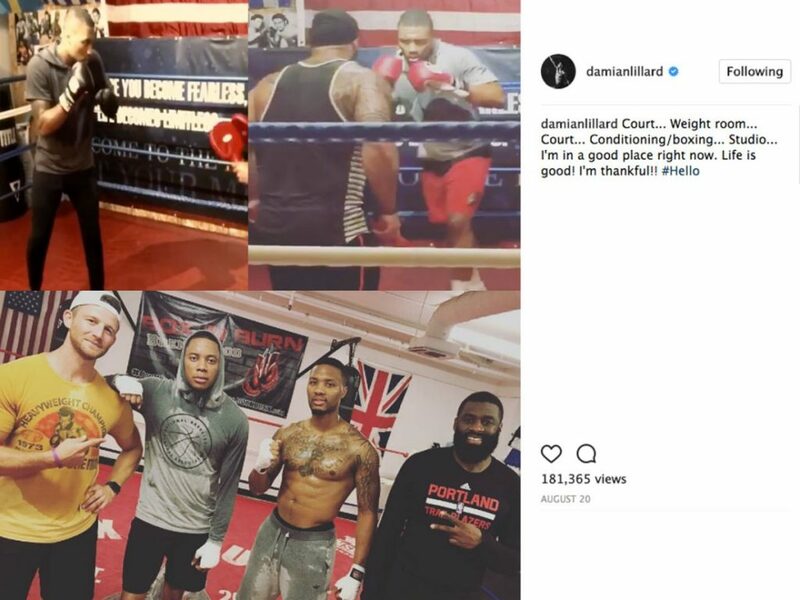 In fact, NBA players like John Wall, Damian Lillard, Kristaps Porzingis, Kyle Kuzma, Iman Shumpert, Moe Harkless, and Jusuf Nurkić have all recently posted their boxing workouts on social media. It’s one of the most intense cardio sports around, but more specifically it places a very balanced demand on the physique. Upper body and lower body work in unison to deliver maximum force. You build your strength to deliver the blows and you raise your agility to move around the ring. It’s pretty much the perfect storm for total body fitness, making it a great overall choice for almost any elite athlete aiming to stay limber and physically prepared for elite training. And of course, playing and practicing the actual sport is key to staying in shape during the off season. 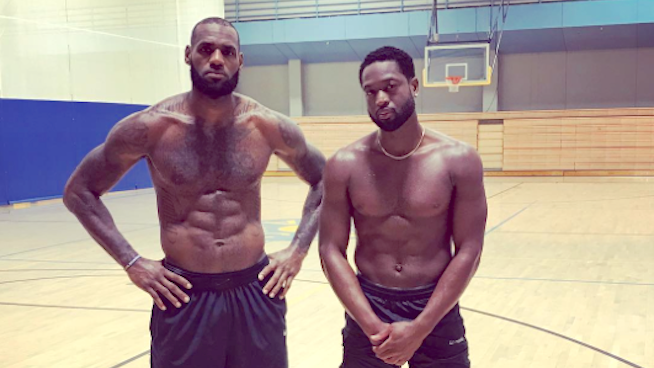 In recent years, many have posted their off-season work outs both as individuals and others where several NBA players gather to play against one another. One of the more well well-known pickup up was a game that featured several NBA superstars in Kevin Durant, Carmelo Anthony and LeBron James playing pickup. On top of just scrimmaging with other players, many dedicated NBA players hire specialized trainers that help them shore up skill sets that need polishing. The most common being working on post moves, three-point shooting, and tighter dribbling so they can come into the next season better prepared..
Elite basketball players need to rise to the challenges of many physical stresses. It’s a sport built around moving lots of body mass very fast, but it’s also heavily reliant on lots of explosive strength. Off season preparation for NBA players is therefore diverse, demanding and difficult.